Alumno is delighted to announce that the transformation of Park Hill has taken another significant step forward. Following planning submission in early May, Sheffield City Council has granted planning permission for Phase 3 proposals for 70 units to accommodate 356 student residents, alongside new commercial space for shops, cafes or a gym. 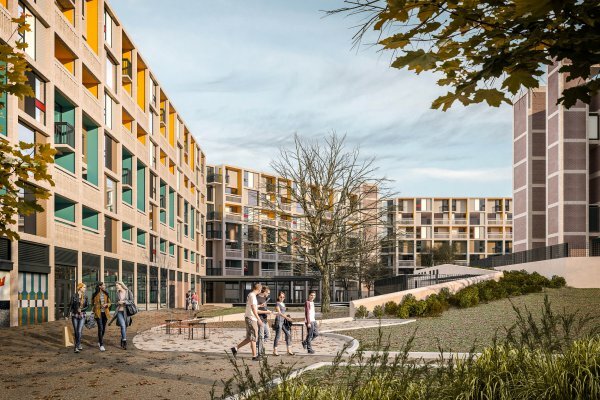 Councillor Jack Scott, Cabinet Member for Transport and Development at Sheffield City Council, said: “Park Hill is quite simply one of the most iconic places to be in Sheffield, and can hold its own with any architectural landmark in the whole of Europe. These phased plans are a further sign of progress and confidence in the area, which is now thriving with an active community with regular events, a new cafe, businesses and the home of S1 Artspace who attract visitors from all over the city with their ongoing exhibition and events programme.